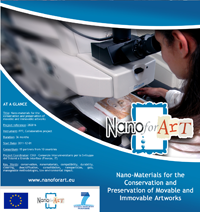 The main objective of the NANOFORART proposal is the development and experimentation of new nano-materials and responsive systems for the conservation and preservation of movable and immovable artworks. While the progress in material science has generated sophisticated nanostructured materials, conservation of cultural heritage is still mainly based on traditional methods and conventional materials that often lack the necessary compatibility with the original artworks and a durable performance in responding to the changes of natural environment and man-made activities. The main challenge of NANOFORART is the combination of sophisticated functional materials arising from the recent developments in nano-science/technology with innovative techniques in the restoration and preventive conservation of works of art, with unprecedented efficiency. The research activity will be focused on the development of manageable methodologies, based on nanosized structures and with a low environmental impact. The main tasks include the production of dispersions of nanoparticles, micellar solutions, microemulsions and gels, in order to offer new reliable pathways to restore and preserve works of art by combining the main features and properties of soft and hard-matter systems for cultural heritage conservation and preservation. In the second part of the project great importance will be given to technology transfer to SMEs that will play an important role in the standardization of applicative protocols, in the up-scale and commercialization of technology and in the evaluation of the eco-toxicity of nano-materials. A fundamental part of the project is also related to the role of end-users. Important museums, such as the National Museum of Anthropology and History of Mexico City and the National Museum of Denmark, will validate the technology and the methods developed in the first part of the project, and provide training activities and dissemination of the developed techniques.